You will receive a "Superbill" for your session; which will allow you to submit it to your insurance for potential reimbursement. Check with your insurance before coming in for services as there is no guarantee of coverage for out of network providers. Depends on the type of service. Please inquire. What Type of Counseling is Provided? I am trained in working with domestic violence (both victims and perpetrators), military service members and their families, youth, couples, spiritual guidance, child abuse cases, trauma and family therapy. DO I have to Be A Parent to Attend Parenting Classes? No. Some attendee's are parents-to-be, caregivers, grandparents, volunteers, professionals, etc. Will Other people know I attended your classes? 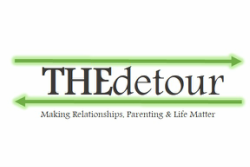 THEdetour is bound by confidentiality rules. Once you start services with us, we only communicate with those entities you give us permission to unless it is determined that you are a danger to yourself or others. Mandated Reporting laws apply in those cases and if safe and appropriate to do so, you will be informed of this. Click on the class or service that you would like to sign up for and it will take you to the contact page. Fill out the information for which class you would like to take and someone will return your call. Where are the Classes Located At? For individual services, the classes will be provided in the home. All classes come with a certificate of completion; as well as record of attendance held for three years after closure.